Drop by the Village this summer to revisit short, feature and documentary films and web series that have marked our communities over the past two decades, along with fresh creations that are breaking new ground. You know summer is on its way when a wave of colourful balls adorns the skies over the Village. The arrival of the serpentine strings of spheres, created by landscape architect Claude Cormier, kicks off four months of public art, a pedestrian-only Sainte-Catherine East and a must-see film series, co-organized by LSTW. 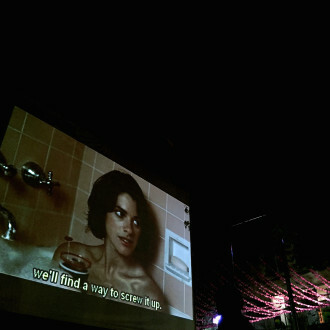 We are pleased to unveil this year’s open-air program of international movies, in partnership with the Aires Libres festival. 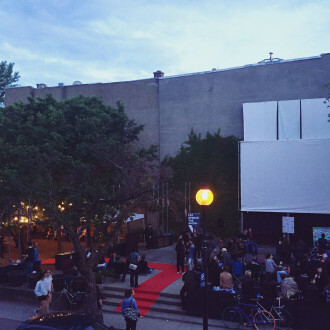 Twelve diverse offerings, screened weekly from June to August at dusk in the Parc de l’espoir at the corners of Sainte-Catherine Street East and Panet. In case of rain, screenings will be moved to the Thursday night. Visit the Lez Spread the Word Facebook page for more details. Aires Libres is a public art event that takes place from May to September on a pedestrian-only Sainte-Catherine Street East, between Saint-Hubert and Papineau.